It is a great pleasure for me to be here, as the Founder of the International Raoul Wallenberg Foundation and the International Angelo Roncalli Committee, chairing one of the panels at the International Conference honoring the memory of Pope John XXIII. 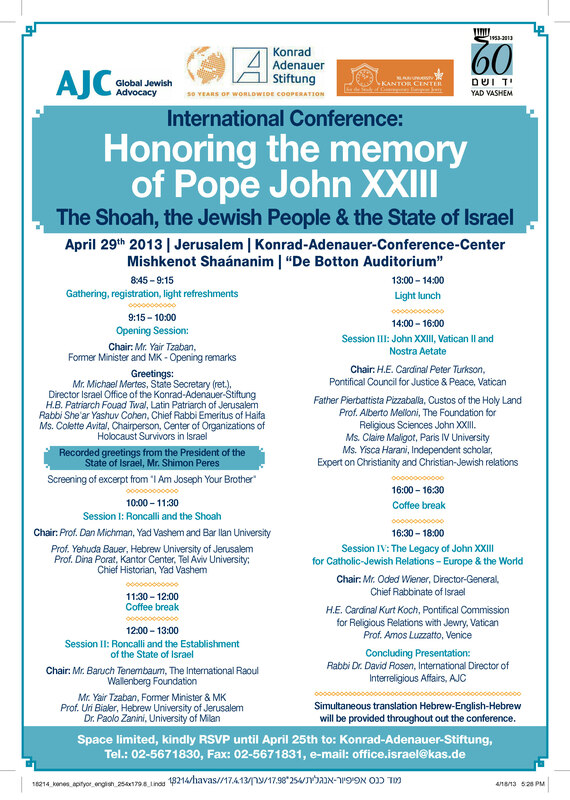 Angelo Roncalli was a great friend of the Jewish people and of the State of Israel, as I hope it will transpire from the presentations of the distinguished members of our Panel which will discuss Roncalli’s relationship to the Establishment of the State of Israel. During the Shoah, Roncalli went out of his way to help as many European Jews as possible. After the war, he played a significant role in paving the way towards the establishment of the Jewish State, and as Pope John XXIII, he made a significant contribution to a closer relationship between Catholics and Jews. I thank the organizers of this important event, especially Mr. Zaban, the Konrad Adenauer Stiftung, the AJC, Yad Vashem and the Kantor Center for helping us keeping alive the blessed memory of Angelo Roncalli. In a sense, I feel like closing a circle. Back in 2006, the Wallenberg Foundation held in Berlin, at the Vaterunse Evangelical Church, an exhibition called “Ein Visum furs Leben’ (Visas for life). This event was by hosted Pastor Annemarie Werner, leader of the congregation and head of our offices in that city, together with the then Ambassador of Israel in Berlin, Mr. Ilan Mor. On that occasion we presented the Angelo Roncalli awards to three distinguished persons who, during decades, have worked in Germany fostering of the interfaith dialogue. One of the laureates was Dr. Michael Mertes, the incumbent Resident Representative of the Konrad Adenauer Foundation and main host of today’s meaningful gathering. The Wallenberg Foundation has devoted many efforts to preserve Pope John XXIII’s legacy, through street and school naming campaigns, monuments, busts, and back in 2011, by submitting to Yad Vashem the Roncalli Dossier, a mass of documentary evidences (we have brought some copies here, for your perusal) which support our claim that he should be recognized as Righteous among the Nations. Recently, one of our latest initiatives was crowned with success as the Municipality of the City of Ashdod (the 5th largest city in Israel) has agreed, in principle, to name a street or a city public site after Angelo Roncalli/Pope John XXIII. We feel also very encouraged by the recent election of the Supreme Pontiff, Jorge Mario Bergoglio – Pope Francis I. We know him very well, as he was one of the first Members of the International Raoul Wallenberg Foundation. In such capacity and as Archbishop of the City of Buenos Aires, he helped us keep alive the legacies of Raoul Wallenberg, Angelo Roncalli and his likes. Together with Bergoglio’s predecessor, the late Cardinal Antonio Quarracino, the Wallenberg Foundation promoted the erection of a unique Commemorative Mural emplaced at the Buenos Aires Cathedral. This Mural is a showcase that pays tribute to the victims of the Shoah and of the two terrorist attacks perpetrated in the Argentinean capital, back in the decade of the 90’s, against the Israeli Embassy and the AMIA Jewish Community Center. As I said, this Memorial is singular in the sense that it is the only Jewish memorial inside a Catholic Church, let alone a Cathedral. After Quarracino’s death, Monsignor Bergoglio succeeded him and took custody of this precious symbol, encouraging Jews to visit it and above all, fulfilling Quarracino’s last wish to be buried next to this exceptional Mural. I believe that Jorge Mario Bergoglio/Pope Francis I will follow the magnificent path set by Angelo Roncalli/Pope John XXIII, nurturing a respectful and fraternal dialogue between Christians and Jews. 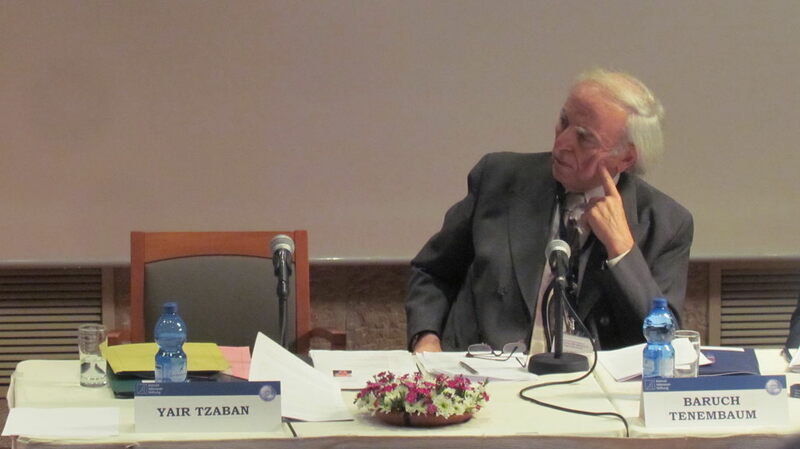 Mr. Yair Zaban is a renowned Israeli politician, former Member of the Knesset and Minister of Absorption in the governments of Itzhak Rabin Z’l and Shimon Peres. Few people know that as a young person, Mr. Zaban was the personal secretary of Dr. Moshe Sneh, one of the leaders of the Yishuv and someone who knew Roncalli and his involvement in the creation of the State of Israel. Prof. Uri Bialer is a world-famous Israeli scholar, Maurice B. Hexter Chair in International Relations-Middle Eastern Studies, a specialist in the relationship between the Vatican and Israel. He has published a large number of articles and books, including the Cross on the Star of David – The Christian World in Israel’s Foreign Policy 1948-67, which is very relevant to our discussion. Last but not least, Prof. Paolo Zanini, presently a fellow researcher of the Department of Historical Studies at the State University of Milano. His main academic interests are focused on the relations between the Holy See, Zionism and the Palestine question during the Mandatory Period. I am sure that the three panelists will enlighten us, each one with his own perspective, shedding light on this riveting aspect of Roncalli’s actions.